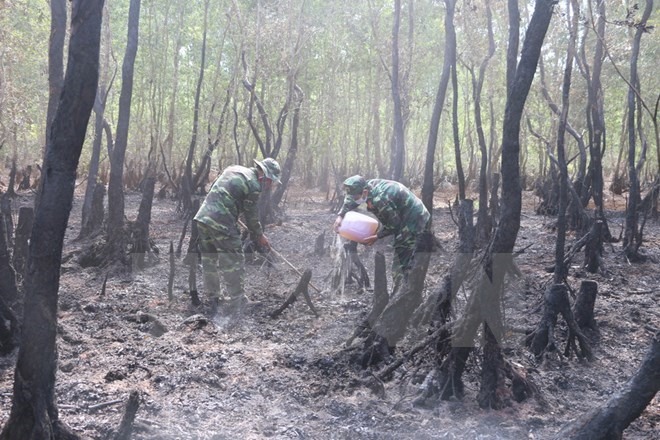 AN GIANG - Some 36 ha of cajuput forest in Tri Tôn District of An Giang Province was destroyed by a major fire, Lý Vĩnh Định, head of the district’s forest protection station said on Saturday. The damaged area included 34 ha of secondary cajuput forest and 2 ha of primary forest. The fire started last Friday noon when residents disposed of cigarettes near the forest. The flames then spread to the forest. Besides cajuput area, more than 75 ha of floristic composition was razed.